RPM is a premium grain service that we have offered since 2001. The RPM program is managed by Cash Marketing Alliance LLC which is a sister company of AgWest Commodities. 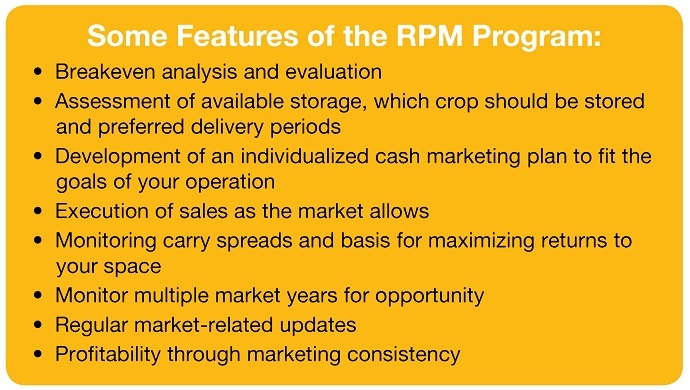 As a client in the RPM program, you will work with one of our trained Cash Advisors in developing a cash grain marketing plan that meets the financial objectives of your operation. It all starts with your cost of production. No two farms are alike when it comes to the breakeven cost of raising a bushel of grain. With the help of your Cash Advisor, it’s critically important to determine your projected cost of production approximately one year in advance of harvesting the crop. This then becomes the foundation for your entire marketing plan. you begin raising the best crop possible. We take care of the rest. Your Cash Advisor has been trained in merchandising techniques that earn commercial facilities a return on their storage space. Contract selection, monitoring carry spreads and basis are all pieces of the RPM service. You may understand how carry spreads work in conjunction with basis offerings; and if you do, you’re part of a small minority of producers. Merchandising is an art form of its own and the RPM program was developed and is managed by folks who have decades of grain merchandising experience. You are always in the loop and it is always your plan. We work with you on merchandising your cash grain -- we do not take control and make decisions on our own. You have the final say on all sales and it’s your choice of which buyers we will use. You are always in control. We simply bring expertise and ideas to the table that you may not currently have at your disposal, and we provide the discipline of executing your cash marketing plan. The RPM program can work for all producers and especially if you have on-farm storage, you’ll want to take a look at this unique marketing service. RPM was the first service of its kind in the western cornbelt and although there have been a couple of look-alikes in recent years; this program maintains some very unique aspects. If getting enough grain sold at the right time is a difficult chore for you or if you have on-farm storage and little merchandising knowledge, you need to take a hard look at RPM.